As a massive collection of artists, each bringing forth a unique talent and voice of their own, Materia Collective has made an irrefutable impact within the genre of video game music. With so much variety across series and platform, and an ever growing discography supporting the name, it is nigh impossible for an avid gamer and music-lover to not find something relatable. For us, the fans of The Legend of Zelda, Materia Collective’s most recent offering comes in the form of the tribute album FATE. This absolute beast of an album pays homage to those three dark, gritty days we spent in Termina, fighting against time as the moon descended to destroy the world. Sitting at an impressive seventy-nine tracks, the creative names behind FATE strived to reflect these very human emotions we felt when we first played through, while complimenting the soundtrack of one of the most different-yet-iconic Zelda games. The album is divided into three parts, each reflecting a single day, from the anxiety of day one, through the doubt of day two, and finally, into the first feelings of hope during day three. And by the end of the album, we remember our time, our battles fought and won, and ultimately, we look back and remember why this game made such a huge impact on the world of The Legend of Zelda. Zelda Dungeon: What lead you to the decision of forming an album based off The Legend of Zelda? Why choose Majora’s Mask specifically? What aspects of both Majora’s Mask and the series as a whole did you seek to bring out? Sam: Pete and I became involved with Materia Collective in 2016, contributing a few tracks to the Sonic the Hedgehog and Undertale albums at that time. We were more than happy to submit our own arrangements and ideas to these albums, but what struck us most was the camaraderie and support of the members of Materia Collective. We were inspired by our colleagues and friends who were producing their own albums to try our hand at it as well, involving the members of the community that we had grown to love, and Majora’s Mask was our only consideration. We grew up with video games, but only Majora’s Mask left a serious impression on us as kids. It’s such a powerful game, and deals with a lot of serious themes in many different and interesting ways. Of course, we mostly thought it was super fun, and it’s jam packed with secrets and combat, which any kid would love. Our favorite thing about Majora’s Mask is that it stands out in the Zelda series – it’s drastically different in form, style and tone from all the titles before it and since. While we did want to bring out this darker side of the Zelda series, we wanted our album to also reflect the aspects that made it very much a Zelda game: heroism, grandeur, excitement, humor, and adventure. ZD: How did you choose which artists you featured in FATE? 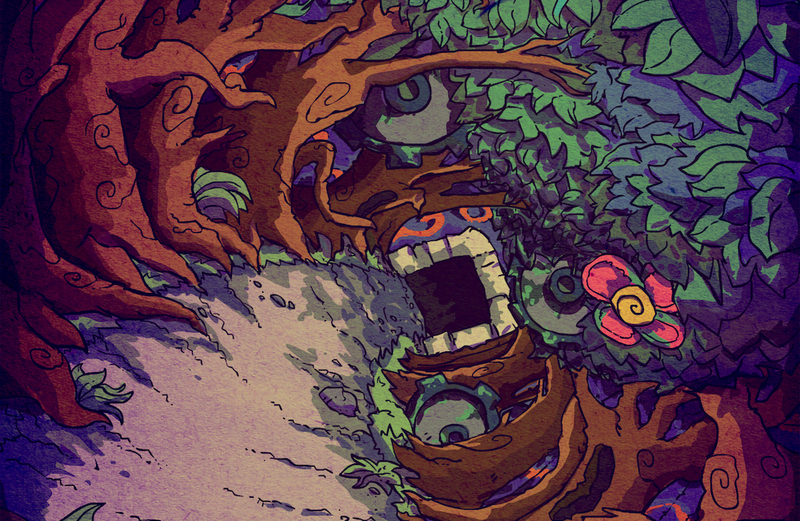 Did the theme of Majora’s Mask influence this selection process, and if it did, how so? Sam: The artists are all members of Materia Collective; we put a word out to the group that we were making a Majora’s Mask album and asked for proposal submissions, and we had over 100 responses! The proposals we accepted were not based on a specific narrative, but we did select tracks based on variety in tone and style. ZD: Take us through the process of FATE’s production: where did you start? What difficulties did you face? What did you learn and what was your favorite part of producing the album? Pete: We started with the proposal process after announcing the album to the community. One tough part of that was deciding how many repeated tracks we wanted on the album, and to ensure that each arrangement would be different enough. We learned a lot about managing a large group of people while still being “hands-off” enough to let everyone’s arrangements progress in their own ways. Sam: We had a check-in process where, about every about every 4 – 6 weeks, we asked contributors to send us an update on their tracks. Our favorite part of producing this album was watching their work evolve from the rough sketches that they sent us early on, and observing their processes to achieve their goals. ZD: So, then, how do you feel about the final product? Is it different than what you expected when you set out? Sam: Because we left a lot of the music up to the interpretation of the members, we weren’t sure what to expect! Our expectations were realized in the sense that we wanted the community to collaborate and share in a very personal musical experience. We were really happy with how it turned out. The producers and musicians really played to their strengths with these remixes. ZD: What got you involved in music, and how did that lead to production? Pete: Growing up, the two of us had very similar musical experiences: learned an instrument, took band/orchestra, played in rock bands together, etc. But during college we took very different turns. While doing some research about audio engineering, I had discovered remixes on websites like YouTube, OverClocked Remix, and Newgrounds, communities of artists who just made stuff on their own for fun. That really got me interested in producing my own music, and led to studying audio engineering and music in college. Sam: Our parents got me a guitar when I was a kid and signed me up for lessons, and I was later recruited by my teacher to play double bass in my school’s orchestra. I had grown up in a household of music lovers – my parents would often play their early prog rock and jazz on their stereo, and that stuck with me. I’m certain the music that I listened to in the games that I played stuck with me as well. In college I pursued bass and classical music, and branched out into jazz once I got to grad school and made some friends who wanted to jam together on a whim one day. That dive into jazz is what got me into arranging music, and once I started arranging, I wanted to start organizing my own concerts. I’ve only done a few since then, but they were enough to get me into doing more projects on the production side! ZD: What about the [Video Game Music] genre drew you in? Sam: There’s just a lot of cool VGM out there, and a lot of great musicians doing remixes too. The whole genre has evolved in a really neat way – composers are using all sorts of different techniques and styles to score a game nowadays, ranging from the old methods and basic chip sounds to full orchestral film-style scoring, and everything in between. For us as fans and arrangers, we’ve been treating this music much like jazz, pop, hip-hop, and even folk musicians would – playing the tunes whenever and wherever, interpreting them in any shape or form. Most music out there can be treated this way, but there’s something special about using the music that we all grew up with and love so much, collectively. ZD: Who are some of your musical influences, and what about them do you enjoy? Sam: How much time do you have? I’ll keep it brief since I don’t want to exceed your bandwidth: I listened to a lot of rock and metal in high school, and grew into jazz and classical later, but I think my biggest musical influence was Emerson, Lake, and Palmer. Their original music was fantastic, drawing influence from the many styles they grew up learning and playing to create their own unique style. They have a few arrangements as well that sound practically like originals. Those are the kinds of musicians that I aspire to be. As for VGM, lately I’ve been listening to a lot of Disasterpeace and Fingerspit – they each vary in their instruments and mediums to create incredible music that fits well with their sources, while still maintaining their own unique voices. Pete: I’m gonna go non-VGM here. Some of my biggest influences are in rock; Black Sabbath, Metallica, and System of a Down were the three big ones for me. Recently, I’ve been getting into heavy bands like Pallbearer, Oathbreaker, Mutoid Man, Cult of Luna, and Old Man Gloom (“NO” changed my life). I’ve also always been a big fan of “impressionist” music like Ravel and Debussy; there’s something so gratifying about the atmosphere and tonal ambiguity. ZD: What are some of your personal greatest successes and challenges in the music industry? How have they shaped you? Sam: With my own work, the most rewarding moments are when I get to play my own arrangements with good friends on stage, who even contribute something of their own to them. I was lucky enough to have several experiences like this – having my own big band in grad school for a short time, performing my arrangements with friends on solo recitals, performing at MAGFest with the band DiscoCactus on multiple occasions, and on Materia Collective projects as well. My struggle has been to make those opportunities happen more often on my own, which I’ve been working on over the past year, which also led to involvement in production of projects much like this one! Pete: A life goal of mine was to compose for an indie game, which I got to do for the first time a few years ago. I’ve found that one of the biggest challenges as an artist is keeping up momentum after completing a project; learning how to accentuate your strengths and improving your shortcomings for your next adventure. Oh, and I get to play with groups like VGO and DiscoCactus sometimes, so that’s cool. ZD: If you could go back and give your younger self some advice, what would it be? Pete: Make more stuff sooner. Fail faster. You learn better that way. Sam: Only look back to remember the good, and to remember what you can do better. Don’t look back to dwell – you’ll stay there too long. Sam: I’m working on making my own website and an updated arrangement portfolio for freelance work, and working towards making more concerts and recordings with our band DiscoCactus happen! Pete: I’m working on some original music at the moment, both composing for indie game projects and writing songs for my band Wyrgan. I hadn’t planned on any more community albums, but I’ve never played Wind Waker… so maybe that could change my mind. In the end, to take on an album meant to pay tribute to such a powerful title as Majora’s Mask was no small feat, yet Sam, Pete, and every single person behind Materia Collective’s new album bore their very hearts in their work. Now, we, the fans, are given the gift of a monstrous, technically and tonally varying, heart-string-pulling album that we can remember just as fondly as the game itself. You can follow Materia Collective on Facebook, Twitter, YouTube, and Soundcloud. To learn more about FATE, check out Materia Collective’s page here. Also be sure to listen to the album on Materia Collective’s BandCamp or Spotify, then let us know what you think in the comments below! Kat Vadam is an Original Content Editor for Zelda Dungeon. Listening to FATE made her want to revisit Termina for the first time in ten years. Follow her on Twitter.